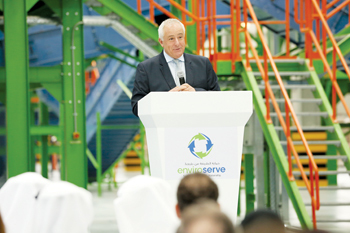 Dubai Industrial Park, officially inaugurated the world’s largest integrated electric and electronic waste (e-waste) recycling facility ‘The Recycling Hub’ by Enviroserve, last month. The state-of-the-art 280,000-sq-ft e-waste recycling plant processes WEEE (waste electrical and electronic equipment), IT asset disposition (ITAD), refrigerant gas, and specialised waste. The facility, which features the latest Swiss technology that surpasses strict EU standards for e-waste recycling, will accept all types of end-of-life electric and electronic equipment. The recycling facility’s mechanical separation process is chemical-free with industrial air filtration, allowing for a 96 per cent recovery rate with zero air and liquid emissions. To put things into perspective, this means 38,000,000 kg of e-waste will be kept out of landfills each year. 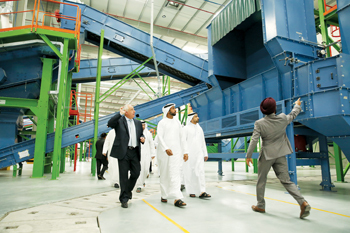 “The launch of the Recycling Hub at Dubai Industrial Park is a reflection of the UAE’s journey towards becoming a global platform that attracts innovative businesses and a successful model of the new green economy. We take pride in our partnership with Enviroserve, a key milestone in our mission to contribute to the development of an advanced industrial sector in the UAE that is focused on innovation and sustainable technology, and we look forward to the far-reaching positive impact that will extend to several regions in the world right from the heart of Dubai,” Saud Abu Al-Shawareb, managing director at Dubai Industrial Park, said. The Dh120-million ($32.67 million) project is backed by the Swiss Government Export Finance Agency and represents one of the largest foreign direct investments in the field of environmental management to date in the UAE. The project will service international e-waste recycling efforts across Africa, the Middle East and the Caucasus. The Recycling Hub is set to benefit from Dubai’s strategic location, progressive policies, as well as the emirate’s intelligent infrastructure. A centre of expertise for electronic waste management in the region, Enviroserve has already begun processing electronic waste for its partner Epson. During The Recycling Hub’s launch, Enviroserve announced its partnership with Nespresso to recycle all of the coffee giant’s aluminium capsules and machines in the UAE. Also during the event, the company announced a regional partnership with Lenovo to recycle and refurbish the latter’s electronic products. The project comes at a time when every year, some 50 million tonnes of electronic and electrical waste is produced globally, of which only 20 per cent is formally recycled. According to a UN-sponsored project finding, the average UAE resident generates 17.2 kg of e-waste every year, most of which contain harmful toxins, such as arsenic, cadmium and mercury.